February 11, 2019 Cupid’s Crossbow is going to return to Fortnite – for a limited time. The crossbow will soon return to Fortnite, likely as part of tomorrow’s update. In keeping with the game’s seasonal Valentine’s theme, the weapon will once again carry romantic decoration as Cupid’s Crossbow. The unvaulting will just be a temporary one, however, so enjoy while you can – and watch out for the bolts in the meantime. 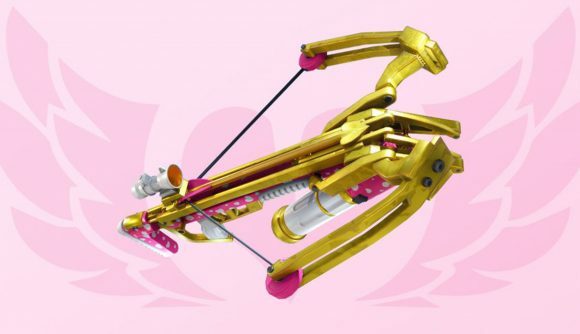 Details on the weapon’s return appeared in the in-game news feed today, with the message that “Cupid’s Crossbow will be unvaulted for a limited time. Eliminate your opponents with stealth and precision.” Most of these weapon teases go live one day before the weapon itself does, which means you can expect the crossbow as part of an update tomorrow. That update will bring plenty of romance in the Share the Love event, including new challenges, cosmetics, and limited time bonuses. It’ll also be a chance to get rewards of your own for using the Support-a-Creator programme – hence the whole ‘share the love’ thing. Love, in this case, means money. The crossbow originally appeared as a Valentine’s special, so its return in this update is certainly appropriate. A different variant called the Fiend Hunter has occasionally appeared for use when PvE monsters are around, but its stats are a bit less effective on human enemies. We’ve got some extra time before the Season 8 release date, so check out the crown of RVs location and the Paradise Palms Shooting Gallery location – you’ve got some extra weeks to finish out that battle pass, but that doesn’t mean you shouldn’t take advantage of what help you can to clear out those last few challenges.